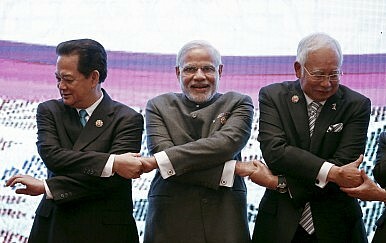 India's Prime Minister Narendra Modi (C) holds the hands of Malaysia's Prime Minister Najib Razak (R) and Vietnam’s Prime Minister Nguyen Tan Dung at the 2015 ASEAN Summit in Kuala Lumpur. How India’s approach to ASEAN has evolved, and where it stands now. The Association of Southeast Asian Nations (ASEAN) has a population (600 million) larger than North America or the European Union; its total merchandise exports stand at $1.2 trillion. Stephen Groff, vice president of the Asian Development Bank (ADB), noted in a 2014 speech in Berlin that if ASEAN were one economy, with a combined gross domestic product of $2.3 trillion, it would have ranked as the seventh largest economy in the world by 2013. He added that it would become the fourth largest economy by 2050 if the existing level of growth continues. Fittingly, ASEAN is considered to be a growing hub for consumer demand and occupies a significant position in global trade flows. Presently, ASEAN is taking the process of economic integration into serious consideration, though with some limitations and constraints. No other regional trading bloc in Asia is talking about a single currency at this moment, which sets ASEAN apart. Plus, ASEAN already has six trade agreements with its neighbors, which includes China, South Korea, Japan, Australia, New Zealand, and India. India is one of the strategic partners of ASEAN. With a total population of 1.8 billion and a combined GDP of $3.8 trillion, ASEAN and India together form an important economic space in the world. Besides an economic partnership, India expects to benefit geopolitically as well from its rejuvenated affinity with ASEAN and other regional countries. In order for India to gain a substantial position in East Asia, New Delhi has moved to an Act East Policy (AEP) now, an update to the 25-year-old Look East Policy (LEP). As ASEAN remains central to India’s AEP, India’s achievements from this strategy are worth watching. It is crucial to observe whether the Modi government will be able to overcome the challenges and give the Act East Policy a much-needed push. The beginning of India’s Look East Policy could be marked in early 1990s. After the end of the Cold War, the force of regionalism began to divide the world into small trade blocs. Under these circumstances, the booming economies of ASEAN offered an economically liberalizing India an avenue that could serve its interests in many ways. Through ASEAN, India wanted to reap the benefits of economic integration and well as discuss security issues like cross-border movements from Myanmar. China’s expanding influence in Southeast Asia, especially in Myanmar, was another concern for India. All these led to the formulation of the LEP. LEP has already gone through two phases since 1991. Phase I lasted between 1991 and 2002, when the primary thrust was toward renewed political and economic relations with ASEAN countries. India became a sectoral dialogue partner of ASEAN in 1992 and full dialogue partner in 1996; that same year, it also joined the ASEAN Regional Forum (ARF). During Phase II (2003 to 2012), the scope of the LEP was broadened to include China, Japan, South Korea, Australia, and New Zealand. India’s then-External Affairs Minister Yashwant Sinha mentioned in a 2003 speech that the new phase of LEP would focus on extensive economic and security issues, including joint efforts to protect the Sea Lanes of Communications and launch coordinated counter-terrorism activities. In 2012, India and ASEAN commemorated 20 years of their dialogue partnership; they became strategic partners and a vision document was released. In between, in July 2011, the then-U.S. Secretary of State Hillary Clinton visited India and advocated for India to play a stronger role in the Asia-Pacific. She coined the term “act East” instead of just “looking East.” LEP 3.0 got a momentum in the same direction under the Modi government as EAM Sushma Swaraj confirmed in 2014 that New Delhi is now willing to “Act East.” Under the AEP, India not only expected to bolster its economic engagements with the region; it yearned to emerge as a potential security balancer as well. On the economic front, the rising two-way trade between India and ASEAN is noteworthy. It grew from $13 billion to $74 billion between 2003-04 and 2013-14. (See Table 1). However trade data between India and ASEAN shows a negative balance against India. The government had to face criticism for signing its Free Trade Agreement with ASEAN on the grounds that, though imports from ASEAN to India have been mounting, India’s exports to the region are not experiencing the same trajectory. ASEAN, as a collective, occupies the fourth largest position in India’s total external trade, while India was only ASEAN’s 10th largest trading partner as of June 2015. As of 2015-2016, India’s exports to ASEAN stood at 9.79 percent of its total exports, and its imports from the region were approximately 10.51 percent of its total imports. So far as investment is concerned, as of 2014, India’s outward investment to Singapore, Indonesia, Malaysia, Philippines, Thailand, and Vietnam stood at a record $128 billion, which is even higher than Indian investment in China, some $119.56 billion. At the same time, approximately 12.5 percent of India’s total inflows of foreign investment come from ASEAN. Geopolitically, India has attempted to demonstrate its ability to play a dynamic role in the region. India sent a strong signal to China by mentioning the importance of maintaining freedom of navigation in the South China Sea in the joint statement released by President Barack Obama and Prime Minister Narendra Modi during the latter’s 2014 U.S. visit. The idea of U.S.-India joint patrols in South China Sea has also been floated, after Defense Minister Manohar Parikkar’s visit to the U.S. Pacific Command in Hawaii in late 2015 (this has, however not been confirmed from the Indian side). Freedom of navigation in the South China Sea is essential for India in order to ensure that its sea-bound trade continues uninterrupted. Through these gestures and the Indian Navy’s proven capabilities in handling natural disasters such as the 2004 Indian Ocean tsunami, India has embarked on a path of greater involvement in the affairs of Southeast and East Asia. In this regard, it is to be noted that India’s interests in the region converge with the interests of countries like Japan, Philippines, Vietnam, Taiwan and, to some extent, Brunei and Indonesia. The very fact that all these countries share territorial disputes with China (or, in Indonesia’s case, uncertainty over an exclusive economic zone) stimulates them to forge closer relationships. Further, it has also become imperative for India to cultivate relationships in the Indo-Pacific region because of the economic and strategic benefits that China is likely to gain with even a partial materialization of its One Belt One Road (OBOR) initiative. On December 31, 2015, ASEAN officially declared the establishment of ASEAN Community. There are certain reservations about India’s prospective benefits from the ASEAN Community building process, just as the advantages of the India-ASEAN FTA are still unclear from India’s perspective. The ASEAN Community itself is marred with problems like intra-ASEAN divides based on the South China Sea disputes; the lack of an ASEAN identity; developmental gaps that prevailing within ASEAN; and many more. For India, another challenge is that the government has not been able to decide the extent of exposure it wants to provide to its remote northeast through connectivity projects designed to create linkages between South Asia (vis-à-vis northeast India) and East Asia. Furthermore, the delays in completing the India-Myanmar-Thailand trilateral highway, the Kaladan Multimodal Transit and Transport Project, and the Moreh-Mandalay Bus Services have created negative perceptions in the region about India’s political will. India needs to be more watchful, as a balance between domestic concerns and its larger national interests is a prerequisite for India enabling itself for a greater extra-regional role. Dr. Sampa Kundu is a researcher at the Institute for Defence Studies and Analyses, New Delhi. Amid a changing geopolitical situation, India is turning its attention to the South Pacific.